Absorbs the widest range of acids, bases and unknown liquids, even those with high concentrations like 98% sulfuric acid and 30% sodium hydroxide. Chemical-resistant mat won't degrade or cause a dangerous reaction upon contact with corrosive spills. Eight layers of 100% polypropylene are thermally bonded to make PIG Mat exceptionally strong; won't rip, tear or fray even when saturated. Exclusive dimple pattern speeds wicking of liquid throughout mat for faster, easier cleanup. Highly absorbent, fine-fiber construction won't leave behind liquids or fiber residue. 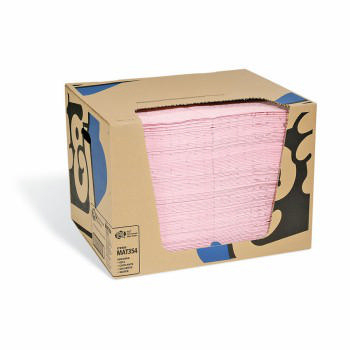 Heavyweight construction is highly durable and absorbent for demanding tasks and large-volume cleanups. Pink color is easily distinguishable to assure workers use the correct mat during a spill emergency. Flame-resistant material won't burn immediately like cellulose mats; melts when exposed to high heat while on the job. Dispenser box makes mat easy to access, carry and store while protecting contents from dirt and moisture.